Description: This Divyadesam is located between Kumbhakonam and Tiruvaikavoor in the village of Tyagasamudram. 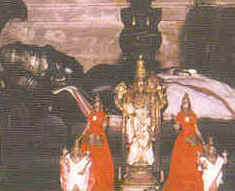 Deities: The moolavar here is Valvil Raman, in a reclining posture facing east and the Taayaar is Hemambujavalli (Potraamaraiyaal). Legend has it that this shrine is associated with the Ramayanam, and that Rama said to have offered moksham to Jatayu here. Sita is not seen with the moolavar, as this temple represents the state where he was separated from Sita. There is a separate shrine for Bhumi Devi. This temple is administered by the Ahobila Matam.This temple with 2 prakarams and a 60 feet high Rajagopuram covers an area of about an acre. Festivals: Five worship services are offered each day, and the annual Bhramotsavam is celebrated in the month of Pankuni.